The ever complex and increasingly digital commercial world that we live in means that there are so many marketing tactics and trends to consider. Which ones will work for your business? Which ones will cost you money? Can you use one without the other? The truth is: no one tactic should work in isolation, but rather as part of a strategic digital marketing plan – combining a number of strategies together to drive more effective and impactful results. Instead of exploring the power of programmatic advertising, the benefits of user-generated content, or how keyword optimisation can increase your organic reach – think about how they can be used in conjunction. In this post, we’ll outline the key elements of any digital marketing strategy, linking ‘paid’, ‘earned’ and ‘owned’ media into a singular approach to build brand awareness and increase sales. 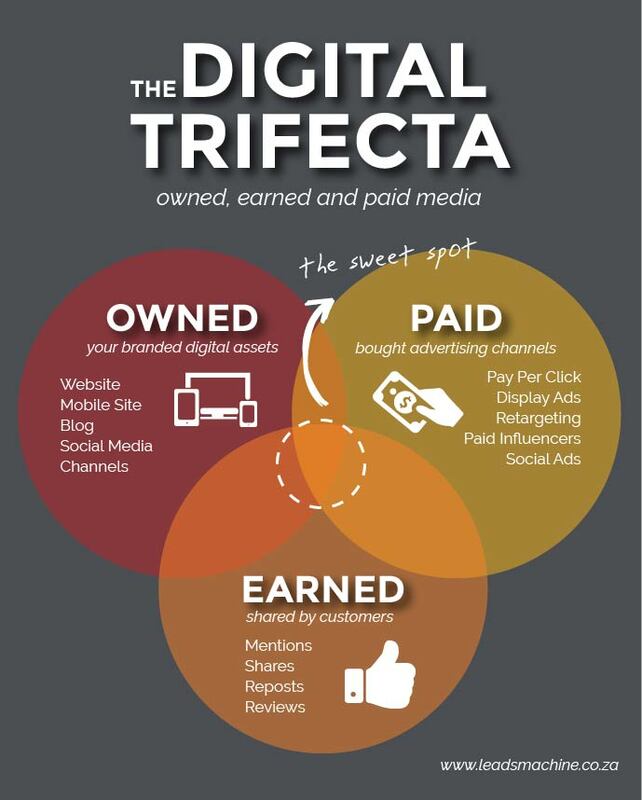 We call it the Digital Trifecta. Take a look at your owned social media channels. Now take a look at where your earned social media is coming from. This will allow you to reveal the channels on which your audience engages most, and therefore where you should be spending a little bit more time and energy. When user-generated content comes your way – use it. Leverage earned media by promoting it on your owned channels, whether it be a testimonial you got, a review that was posted or real-life photos of your product in action. Turn owned into paid by evaluating your social content and paying to promote only those with the highest engagement, also known as your ‘unicorn’ content. You can use your owned and earned media to plot out where you stand against your competitors, in terms of how active they are on social media vs. how engaged their followers are. Create something that people want to share on social media. For example, Starbucks creates colourful and exciting products with the main purpose of encouraging earned social media.